This Episode, the final one in the series, takes the story of Big Flame up to and beyond its fragmentation in 1984. 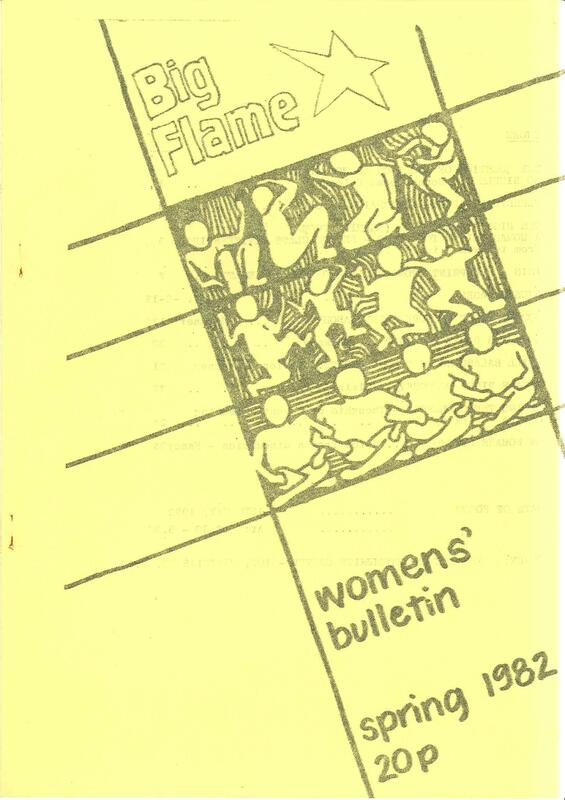 Previous Episodes have discussed key debates at Big Flame Conferences, from the first in 1975 through to 1981.This one covers the last two BF Conferences in 1983 and 1984 and, more generally, looking at the organisation’s last years. 1982-84 saw membership numbers continue to fall. Relatively few of those who were members at the time of the 1975 founding national conference remained in BF. Judged by the makeup of the National Committee (NC), the leadership of the organisation had passed to a new generation. Nearly all had joined BF around 1977, or even later. The NCs elected (or appointed) in 1981 and in 1983 both suffered from the resignation of members (some from BF as well), in many cases with no replacement coming forward. There were less publications. No new pamphlets were published. The last issue of the journal Revolutionary Socialism was Autumn 1982, and of the paper July-August 1982. 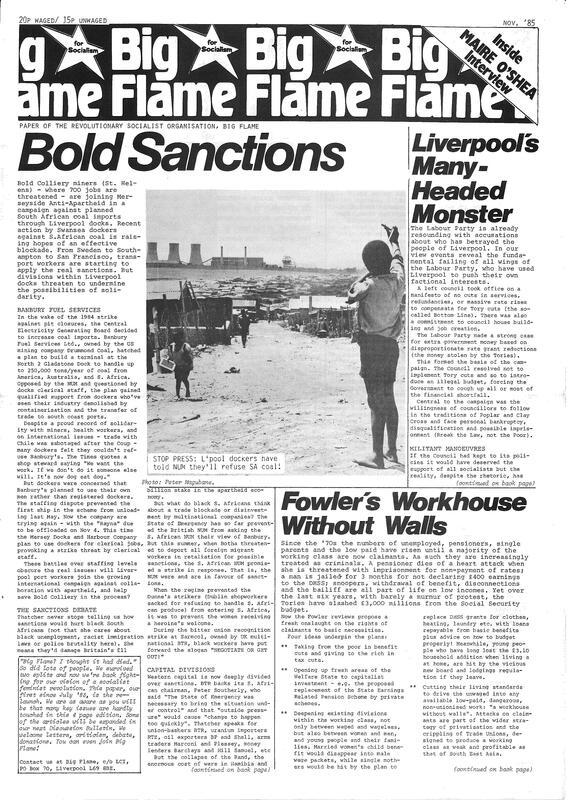 One BF publication, Anti-Nuclear Action, did carry on appearing in 1983-84. Minutes of NC meetings in 1982-84 reveal several discussions of “the crisis” in Big Flame. This was linked to a general down turn for the left and many members prioritising local work. A small number of individuals were keeping the organisation going. To counter a lack of direction in BF, the idea of a relaunch was proposed on a number of occasions. Two tendencies remained in Big Flame after its 1981 Conference: “Emerald Street” (whose perspectives had won the Conference vote) and “Facing the Challenge” (for the positions they argued at the Conference see Episode 27). Because the NC was split between the two tendencies, it found it difficult to give a lead to the organisation. Some NC members saw the next Conference as the way to restore a sense of direction. In the words of one NC member: the NC was “locked in a dead end argument”, there was a need to “move the debate forward” and the next Conference would be “decisive” (Discussion Bulletin September 1982). However, in 1982 there was no annual Conference. The next Conference did not take place until April/May 1983. By then the membership of BF had fallen from 125 in 1981 to 71 members and 28 sympathisers (a 1981 Conference motion had made the latter a formal category). 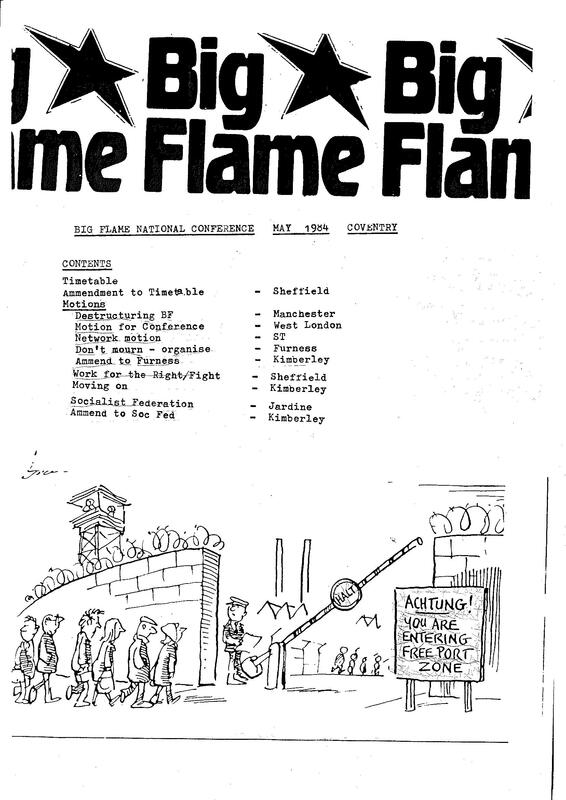 Four Big Flame local groups had disappeared, leaving groups in only seven cities or towns (including London which did had a number of separate branches). Surprisingly, by the Conference both tendencies had also stopped functioning, and no-one submitted a “future perspectives” document setting out priorities for the organisation. The approach to Irish solidarity work, between support for the Troops Out movement (TOM) positions and some who wanted clearer support for the forces resisting the army in Ireland. The issue was deferred to a Day School, where the TOM position was confirmed. The closest thing to a document which assessed the current situation was this article, written in support of motion calling for BF to produce an updated and comprehensive statement of its politics: Big Flame in the Blip Chip Age. It argued that the crisis in BF was part of a general crisis of revolutionary politics. To pick up the pieces again an open and honest debate was required which would look changes in class composition, the impact of new technologies, and the decline of working class and autonomous movements. Rather than the Conference documents a more developed discussion of the current situation could be found in the columns of the newspaper. Particularly two article in the February-March 1983 issue. The first was: Britain in 1982. This rejected the idea that there had been a down turn, even though it acknowledged that traditional working class struggles were at a low point. It drew attention to the inner City riots and Greenham Common protests, and looked to the peace movement to turn the tide. The second article was No More the Working Class. This saw the Labour left in retreat and the socialist strands of the autonomous movements as in decline. It saw Andre Gorz’s book Farewell to the Working Class as providing a useful analysis of the way the working class had been transformed. BF supporters needed to prioritise work where revolutionary ideas were still alive or can be developed e.g. anti-imperialist campaigns, anti-police campaigns. A letter in the next issue of the paper – April-May 1983 – responded to the two articles: Red and Green (letter). It accused the authors of finding forced optimism which bore little resemblance to their previous analysis. Gorz’s investment in the new social movements as the bearers of the communist project was criticised. These movements might share a theme of autonomy, but not a common politics. The development of utopian politics along green lines contained pitfalls. Not just a tendency to insular first-worldism, but also an anger which might be easily contained. As well as agreeing to produce a new statement of Big Flame’s politics, the 1983 Conference passed two parallel motions. One was to aim to publish a book on BF containing extracts from previous pamphlets and documents. The other was to produce a programme which would contain “plans for future priorities”, an “assessment of tasks” and “political slogans”. These can be added a project already underway since the 1981 Conference – to rewrite the “Introduction to Big Flame” pamphlet, a version of which was last published in 1980 (see Episode 2). None of the four ideas reached fruition. Of the four, the NC seems to have taken up the Programme project most enthusiastically. There were several discussions about its contents at NC and Commission meetings during 1983-84. Drafting the Programme does not appear to have got anywhere near the final stages, and an increasing number of number of BF members expressed disquiet. Some at the length of time the project was taking, others questioned the priority it was being given or even the need for it at all. The next, and final, Big Flame Conference took place in May 1984. There had been a further fall in membership numbers. According to the National Secretary there were now 45 members or sympathisers still active in BF (compared to 99 at the time of the previous Conference). One contributor to the debate (who was arguing for the organisation to carry on) put the number of activists remaining at 30. There were now only four local groups (and none in London). The key debate at the Conference was whether BF should continue, and in what form. The suggestion that Big Flame might turn itself into a network rather than an organisation had been flagged up much earlier. For example in 1982 by those attending a “Facing the Challenge” meeting and in a letter from a prominent member of this tendency (see Discussion Bulletin April-May 1982 and Information Bulletin June 1982). However, I believe that the first time this was strongly advocated rather then included amongst a list of options was in this article by another ”Facing the Challenge” supporter in the Discussion Bulletin of June-July 1982: Death & Birth. The article argues that Big Flame’s lack of self-confidence is part of a crisis of the left due to a restructuring of capital. It should seize the initiative and fight on new ground. The future lay in local groups. BF should disband and its politics arise anew. As the author of the document said at an earlier NC meeting: “Death is positive. It is proof of progress” (NC Minutes April 1982). The network option was not the property of one political current. Someone who had supported “Emerald Street” also argued the BF should dissolve in a letter published in an Information Bulletin dated 1 June 1983: A Letter from a Leeds Comrade. It should be replaced on a loose network focusing on local work, apart from the production of a magazine publication. Those who argued for the network option believed local political activity would be more effective without the burden of maintaining a national organisation. At the same time educational discussions and the exchange of ideas could continue. Those who argued for the organisation believed, that despite the reduced numbers, collective decision-making, collective activity and collective responsibility were important and should continue. Three different local groups submitted motions for the 1984 Conference advocating a network. The one selected for voting was Motion from Sheffield BF (not agreed). The vote was tied 16-16, so the motion fell. A motion in favour of an organisation was then taken: Motion from Furness/Amendment from Kimberley. After the amendment was agreed 11-9, the amended motion was passed 17-14. One other motion was passed before the two groupings divided to consider their futures. This welcomed the formation of the Socialist Federation, and encouraged BF members to work with it at the local and national level. The Federation, largely formed through the coming to together to a number of different groupings which had left the Socialist Workers Party (SWP), seems to have only lasted a couple of years after 1984. The 17 people who voted for the successful motion remained members of what they continued to call Big Flame (sympathiser status was abolished after the Conference). Instead of an NC there were National Meetings open to all members every month or two. Only one local branch carried on meeting (with the BF story turning full circle as this was in Liverpool). The main achievement of the grouping was to bring back the newspaper for three issues between November 1985 and Summer 1986. Here is the first of them: Big Flame Newspaper November 1985. Of those who supported the network option, the largest local group which carried on was in Sheffield using the name Moving On. They maintained a loose relationship with a smaller grouping of ex-members (who had left before the 1984 Conference) calling themselves the East London group. For both the primary focus was on local political activity. All these grouping were tiny, even in comparison to the small organisation Big Flame had always been. Therefore, I think it most appropriate to say that the BF story ended in 1984 with the May Conference. Since the 1980s former members of Big Flame have pursued many different political trajectories. Some (including people who voted against the membership motion at the 1981 Conference) spent time in the Labour Party. Very few are members today. A smaller number joined the Greens (and again some of these have left). Hardly any seem to become members of another revolutionary socialist group. However, a high proportion of former BF members are still political active 30 years later in anti-racist campaigns, international solidarity work and other forms of struggle. Notes: (1) This series does not give a full picture of Big Flame. Doing that would need more than another 30 Episodes. There are some omissions of which I am particularly conscious: BF’s involvement in Southern Africa solidarity work, the Anti-Nuclear movement, community struggles particularly housing, other areas of workplace struggle (apart from the few mentioned), and the approach to culture/the arts. (2) For BF’s last years I have been able to uncover far fewer old documents. I also sought information from some of those who were around at the time, but and found their memories to be somewhat foggy. Therefore, I would be even more grateful than usual if anyone is able to help fill the gaps in my knowledge.